The rotolight can be installed in any application where light maintenance by a torsion control lowering system is deemed to enhance safety by eliminating strain injuries of other lowering light systems. Lowering Rotopost can be configured to lower parallel or perpendicular to its adjacent thoroughfare, eliminating the need for elevated working conditions. Variable Speed Limit / Lane Use Management Rotopost. 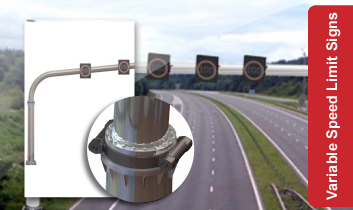 Our flagship product provides maximum bang for buck so more managed motorways can be deployed for minimum capital cost while ensuring safety of maintenance personnel and no need for ongoing traffic control costs. 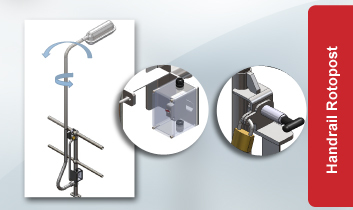 The signals rotopost can be deployed for roads or railway applications. The signals can be placed over the mainline to provide exceptional viewing by transport users and ensure maximum possible compliance. 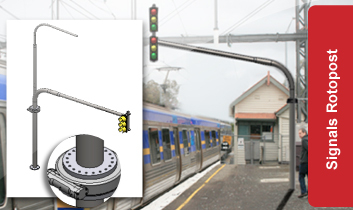 The signals can rotate off the mainline so no ongoing traffic control costs are required. 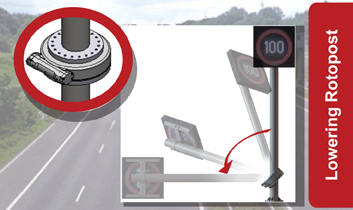 The street lighting rotodrive can be installed on centre median and difficult to reach luminaires. 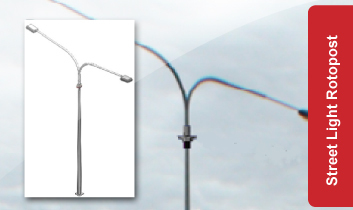 Safety can be increased by being able to rotate the double outreach so both lamps can be changed from a single rolling lane closure, reducing the exposure of maintenance personnel to working near live traffic. Costs are reduced by only requiring one lane closure of the safest direction rather than two.